Not to be confused with an everyday stroller or pram - or an all-terrain design, a jogging stroller is specifically designed with exercising, and running in particular, in mind. The latest models feature fixable front wheels and two larger rear wheels, precision steering and impressive suspension that make it easy to glide over a range of surfaces at speed, all while your child sits safely and comfortably inside. Designed to be used once your baby can hold up their head, the best running buggies offer padded and vented seats for your child, handy sun and rain covers with ‘peek-a-boo’ windows and five-point harnesses that keep little ones securely seated. You’ll also find height-adjustable, easy-to-grip handlebars that offer a one-handed break option and a wrist loop to give you ultimate control when you’re on the go. Ergonomic bodies that have storage space and fold neatly down for loading in and out of the car as efficiently as possible are also now readily available. Here is our pick of some of the best designs around. 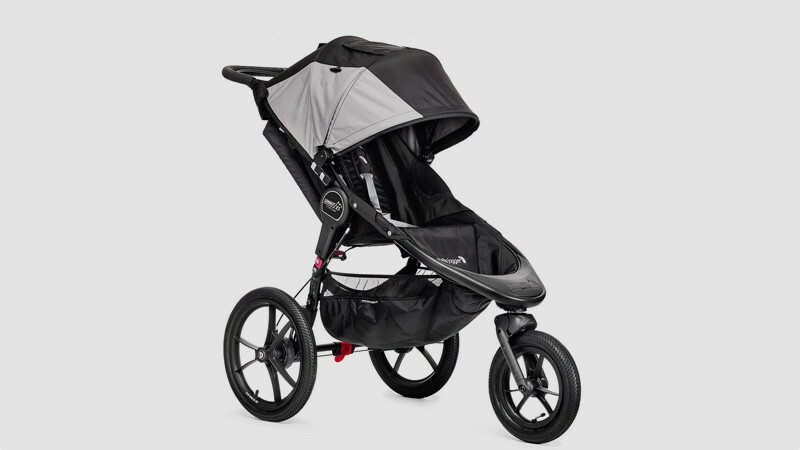 If you’re serious about running, it may be worth investing in this impressively ergonomic all-terrain stroller by Thule. It features two 16-inch rear wheels with impressive suspension that make for a smooth ride. It comes with a swivel front wheel that can navigate the busiest of high streets and be easily locked into place when you’re ready to pound the pavement or park. Its 11.7kg body can be neatly folded with one hand to a flat 87 x 58 x 34cm so it easily fits in the boot. We like the comfortable handlebar that can be adjusted to suit a range of heights and the integrated twist brake that’s easy to access when you’ve gained momentum and need to stop quickly. The padded seat will provide comfort to kids up to 34kg in weight, while the five-point harness reclines to a near-flat position, ideal for kiddy power naps. The storage compartment isn’t the biggest you’ll find, but it is zip-able and allows for quick and easy access to your baby essentials and a large bottle of water. 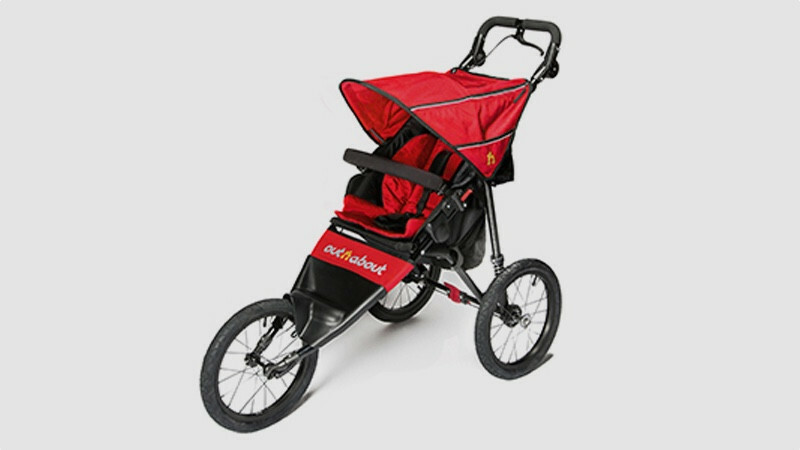 Not all Baby Jogger buggies are suitable for use while exercising, which is slightly confusing considering the brand name. The Summit X3 and its sleek black design, however, is. Its wheels are pneumatic designed to be pumped up every so often, but it’s worth it for the all-wheel suspension and lightweight frame that makes the buggy a delight to push. It comes with a handlebar-controlled wheel lock, which makes it easy to shift between exercising and strolling mode, and the handlebar hand-operated rear-drum brake makes it easy to stop in an instant. The seat also reclines to a near-flat position to make it comfortable for your tot to sleep while you channel your inner athlete around the park. A well-thought out model that’s reasonably priced, what’s most impressive about this design is its ability to fold into one compact unit, with a simple pull of the strap, so its ready for transporting or storage. 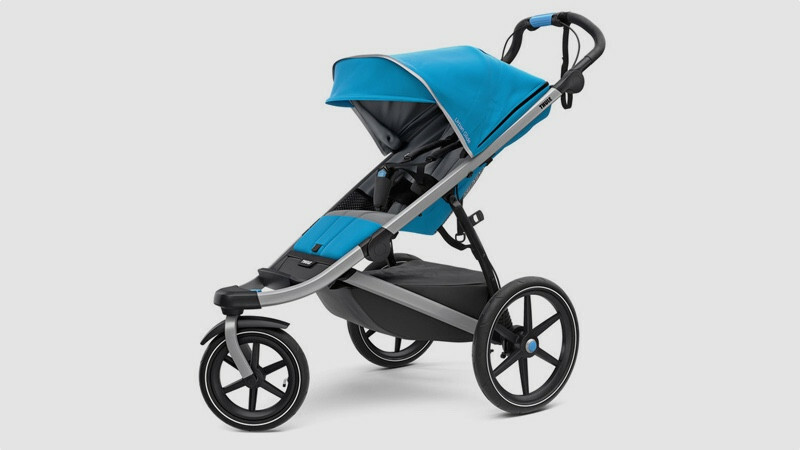 One of the lightest models in our test, the Out n About Nipper Sport V4 weighs an impressive 9.8kg, but can hold a child up to 20kg in weight. Its one of the most high-tech looking designs on the market, with pneumatic tyres that are impressive on a range of challenging surfaces. It also comes with adjustable-height handlebars that range from 83cm to 111cm high. It has independent rear suspension and a fixed front wheel, so while it might not be the best design to use when you’re nipping around the aisle at Sainsbury’s, it will stand you in good stead when you’re running around your the park or venturing out into the countryside. The seat is one of the deeper designs in our round up and will keep your child cosy and sitting snugly behind the five-point safety harness and hinged padded bumper. The seat can be reclined to a number of positions too and the frame has handy storage pockets and a large shopping pouch. When its time to throw in the towel, you won’t need to use up much effort folding it neatly away to store either. 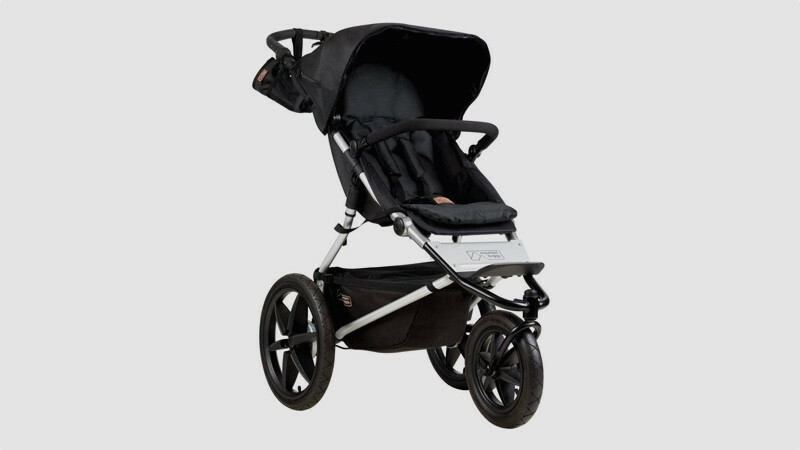 If you’re already a fan of the Bugaboo you won’t need much persuading to opt for the sporty chassis of the Bugaboo Runner jogging pushchair. 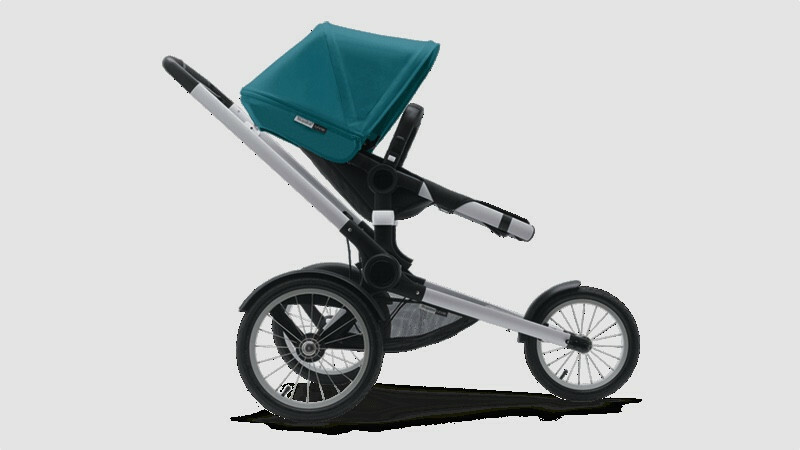 At £610, it’s one of the more expensive joggers in our round up however, but if you already own a Bugaboo seat, you’ll only need to fork out extra for the chassis. It comes with height-adjustable handlebars and a reversible and reclinable seat – so you can have your baby facing you if the wind is particularly fierce. The body has a specially designed suspension system to absorb shock while you’re active and creates a smooth ride on a buggy that’s a joy to push. Like all Bugaboos though, you’ll need car boot space if you want to easily transport it, as the buggy divides into two parts and doesn’t fold up as compactly as many of its jogger rivals do. The design of the Terrain has been well-thought out for active parents and can be folded as easily as it can be assembled. Finished with either ‘onyx’ (aka black), ‘solus’ (aka yellow) or ‘graphite’ (aka grey) detail on its ergonomic body, it has a lightweight aluminium frame and a seat that is made from soft and durable fabric. It's wipe clean, water- and fade-resistant too. Whether you’re out walking or running a 5K, you’ll find the hand brake for controlled slowing down and a foot pedal park brake for a complete stop useful features on this design. The body includes two air-filled 16-inch rear wheels and one 12-inch front wheel seat that can be adjusted from upright to full recline, making it safer for younger babies too. We love the fact that the creators of this buggy have thought through the design to the last detail – it comes with two handy bottle holders and a 10kg capacity gear tray with storage pockets. No doubt a welcome addition for any mum, or dad, on the run.